Together, Apple and Samsung accounted for 103 percent of mobile phone profits in 2012, a number made possible because of losses incurred by rivals Motorola, Sony and Nokia. Apple took a commanding 69 percent of handset profits last year, more than doubling the next closest company, Samsung, which accounted for 34 percent. Together, that gave the two companies more than 100 percent of the industry's profits, according to research released on Wednesday by Canaccord Genuity. That's because Nokia's losses gave it a negative 2 percent of industry profits, while Motorola and Sony Ericsson both accounted for minus 1 percent. In fact, the only other company to see any positive in 2012 was HTC, which accounted for just 1 percent of industry profits. Both BlackBerry and LG are estimated to have broken even. Apple's share of the industry's profits were even greater in the fourth quarter of 2012, when the company launched its latest flagship handset, the iPhone 5. 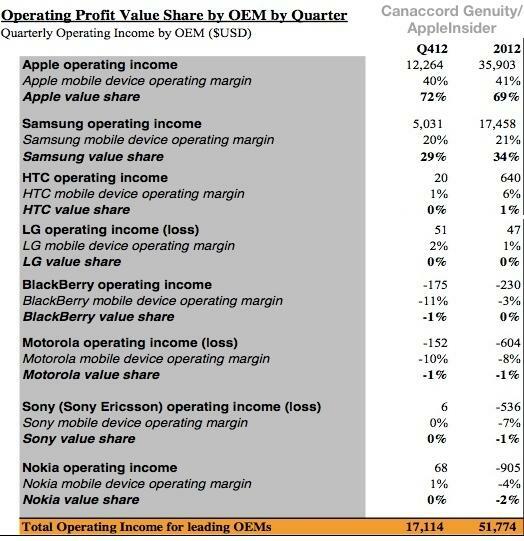 In the holiday quarter, Apple took 72 percent of the industry profits, while Samsung's share slid to 29 percent. With few major catalysts on the horizon, analyst Michael Walkley of Canaccord Genuity expects Apple and Samsung will retain their dominant shares of the handset industry for the foreseeable future.